I'm in my second week of adulting (ie working). I now have a routine that includes waking up at 7.30am and going to bed at 10pm. In between, I obviously go to work for 8.5 hours (including lunch) and I'm still figuring out what to do with the remaining 4 hours that I have in the evening. I've asked my colleagues and most of them spend half of that on commuting which I don't have to worry about because my house is just 5 minutes walk from the office. Last week, I would arrive home and feel like dying because I was just tired but I've realised that my body was just not used to it. Now that I'm in my second week, I'm not tired anymore, just bored to death. Yesterday, was a little bit better because my housemate, Hannah was around so I hung out with her while she was making dinner but she's on a business trip today and tomorrow. Therefore, I decided to google the things that I could do. And guess what, I've found a massive list of things to do. One of them being writing a blog post, now here I am! Also included in the list were doing yoga, reading a book, watching a movie (which I've done so much of), going jogging, picking up new hobbies and many other things like that. I guess Google is amazing in the end. Anyway, work has been interesting. I've been learning new concepts and have also been hating my uni for not teaching me the things that I actually need to know. But to be fair, I can only understand things easily now because of the things that I've learnt at uni. Therefore, it's not too bad. Plus, everyone at work seems to always be 'free' to teach me things even when they're extremely busy especially my 'replacement' line manager (who is also my mentor). She let me borrow her textbooks (which I brought home to read) and read I did. She also walked me through concepts, she taught me things one by one, basically, I feel like I have my own personal teacher which is amazing. However, I would always feel as if I'm incompetent. I have heard that with working, there's a steep learning curve before it plateaus so as of now, I can't wait for the time that I can feel less incompetent! That aside, I find myself valuing my lunch time a lot because it's the only time I get to meet the people downstairs! (I'm upstairs) And it's also the only time I get to 'socialise', I'm not going to complain though because we get an hour of lunch. My 'buddy' also comes up to me to see what I'm up to before he leaves for work so I've got that extra bit of human interaction. Very soon... tomorrow actually, we'll be revamping the 2nd floor to become a hang out spot. Can't wait to see what that's going to look like because then, when it's cold and ew outside at least we'll get to hang out and have lunch there. Above is an instastory post during the assessment day. Job hunting hadn't been easy but fortunately enough for me, I've landed a job in an industry that I wanted to be in. I was lucky enough to know what I wanted to do before I graduated which meant that it was easier for me when it came to job hunting. To be fair to everyone, the opportunity did not come rolling to me. If you had been with me throughout my final year, you would've known how much time I've spent in searching for jobs, researching companies, looking through industries, studying for interviews, writing my personal statements (to fit each company) and updating my CV. All of this takes a lot of time and even though I did do all of that to procrastinate, it still took a lot of time. My graduate job would be in the building industry doing building services engineering. Just reflecting back to the past, I decided to do engineering because I wanted to realise my ideas. I picked mechanical engineering because I thought that for sure, one day, I'm going to enter Proton and make it great. However, throughout university, things changed for me. In my third and final year, I was very involved in learning about start ups. 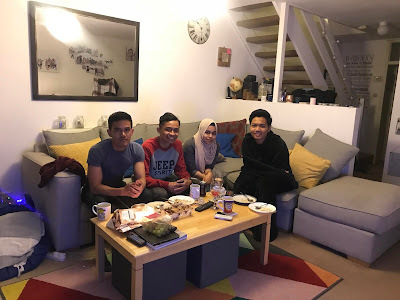 My friends and I went for a competition, we went on a 'tour' of the Malaysian start up ecosystem and I interned at the University of Sheffield Enterprise. This was not the route I decided to take on immediately after graduating, though. But it did open my eyes to realising that there's so much more out there that I could do rather than my initial 'dream' of making Proton great. Sometime during my degree, I've realised that there was nothing within the engineering industry that got me excited. However, in my final year, I did a module about building physics. It was something that to me, wasn't 'mechanical engineering' but it was! I had so much fun during the module, I enjoyed every bit of it and I got extremely good grades for it. Then, I've realised that I've found that one thing within the industry that got me excited. That was when I knew what I wanted to do. I was still very open to other engineering opportunities (I didn't reject any of the interviews I was offered). But to be honest with you, I was already looking into doing other things in the case that I don't get a job in the building industry (including banking - which was extremely attractive). Because I knew what I wanted to do and which industry I wanted to go in, all of my researching efforts became very focused. While I was searching, there were very few job openings and I had just missed the application deadline for one of the biggest company that was hiring. I also looked into working in other countries such as Qatar and Hong Kong and since this girl ain't got no commitments, moving wouldn't be a problem. However, fortunately enough one of the companies that I applied to invited me to their assessment day. I loved the atmosphere of the office when I visited, people were friendly, HR was efficient and the director was very welcoming. A few days later, I received a call and soon enough, here I am! Yesterday was my first day and today, I joined a project meeting. I realised that I have so much to catch up on and hence, I am currently reading a guide on the 'Selection of Control Valves in Variable Flow Systems' while listening to Alif Satar.